MEXICO CITY, Mexico (CNN) -- Mexican authorities were searching Wednesday for two politicians accused of belonging to the Familia Michoacana drug cartel, which is blamed for killing more than 30 federal police officers in a series of attacks since Saturday. Julio Cesar Godoy Toscano, elected July 5 to the lower house of Congress, is accused of being in charge of protection for the cartel, said Monte Alejandro Rubido Garcia, head of the National Public Security Council. Godoy Toscano is half-brother to Michoacan's governor, Leonel Godoy Rangel, who Wednesday urged his relative to surrender. Authorities also said they are searching for Saul Solis Solis, alias "El Lince," who lost his bid for a congressional seat this month. He is accused of being in charge of the cartel's activities in the Huacana area. Solis is a cousin of Enrique Plancarte Solis, a Familia Michoacana leader, Rubido said. Both suspects report to Servando Gomez Martinez, known as "La Tuta," Rubido said. Godoy Toscano was elected as a member of the opposition Democratic Revolutionary Party, known as the PRD. The party said Wednesday it would not protect Godoy Toscano or any member who has broken the law. Godoy Rangel, the Michoacan governor, told a radio station there's nothing he could do to help his fugitive brother. "I cannot protect anyone, not even my children," the government-run news agency Notimex quoted him as saying. He said Wednesday that he has no intention of resigning, because he has done nothing wrong, Notimex said. Solis sought election as a member of the Green Ecological Party of Mexico. The party, commonly called the PVEM, announced Wednesday it had broken relations with Solis. In recent days, Michoacan, the home state of President Felipe Calderon, has become a flash point for the country's war against the drug cartels. The sudden spike in violence followed the arrest Saturday of Arnoldo Rueda Medina, whom authorities described as a high-ranking member of La Familia Michoacana. 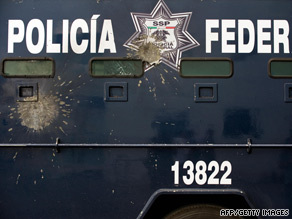 Cartel members first attacked the federal police station in Morelia to try to gain freedom for Rueda, authorities said. When that failed, drug gangs attacked federal police installations in at least a half-dozen Michoacan cities. The Michoacan cartel also is accused in the slaying of 12 federal police officers whose bodies were found Tuesday on a remote highway. Video from the scene showed three signs, known as narcomensajes, left by the killers. They all stated the same thing: "So that you come for another. We will be waiting for you here." Rubido announced the arrest Tuesday of Francisco Javier Frias Lara, known as "El Chivo," in connection with the killings. Frias also is an alleged member of La Familia Michoacana. Reprisals from drug cartels after major arrests have been reported before, but the intensity of the attacks in Michoacan are unprecedented. This week's violence solidifies the cartel as a major and violent player in Mexico's drug wars, said Bruce Bagley, a professor at the University of Miami and an expert on drug trafficking. An unprecedented wave of violence has washed over Mexico since Calderon declared war on the drug cartels shortly after coming into office in 2006. More than 10,000 people have died in that time span, about 1,000 of them police. This weekend, in the border city of Ciudad Juarez, the toll of drug-related deaths for the year topped 1,000, a level the Mexican city did not reach last year until September. At this point last year, the violence-plagued city, across the border from El Paso, Texas, had tallied 596 killings, El Universal newspaper said Tuesday, citing figures from the Chihuahua state attorney general's office. Also in Chihuahua state, a mayor was shot and killed Tuesday morning while on his way to work. Ariel Meixequeiro had twice temporarily left his post because he had been threatened by crime gangs, El Universal said.